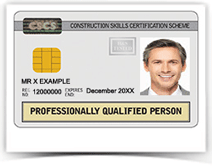 The white/yellow Professionally Qualified Person (PQP) card is for competence assessed members of CSCS approved Professional Bodies, such as ICE, CIOB, RICS and others. Pass the CITB Managers and Professionals Health, Safety and Environment Test. Be able to provide your professional body membership number, level of membership along with a copy of your professional body membership certificate or card. Alternatively if you do not possess a copy of your membership certificate or card you can provide the name, membership number and correct number of someone of the same level or higher as you who is prepared to recommend you or supply a letter or email from the professional body confirming that you are a current, competence assessed member. To book the test please click here. Cards are valid for five years and can be renewed on re-verification of the PQP criteria. To apply for WHITE / YELLOW CSCS CARD, please click here.